Do I need to register to make a Street Library? But we’d encourage you to put a ‘point on the map’ so others can find your library. You can get a high quality outdoor sticker (with your own unique library number on it) from our online shop. There are a few benefits from registering your library that you probably wont appreciate till you’re up and running! Every dollar you spend supports our not for profit mission. You’ll often find people in your neighbourhood wanting to donate books – putting yourself on the map helps everyone! I’ve heard people have a logbook in their library? Well, I think some people do – it’s up to the individual librarian. If you’re a hands on kind of person, who like to know whats going on, then maybe a logbook makes sense. Think of it like a ‘visitor book’ for your library. Try it, and see what happens – then share you story with us. 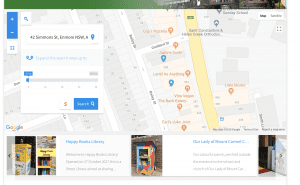 I want to put my library on the verge – do I need permission from the Council? Long answer = Don’t put it on the verge. Longer Answer = Maybe Not. You are always better off installing your library on your property, or property you control. 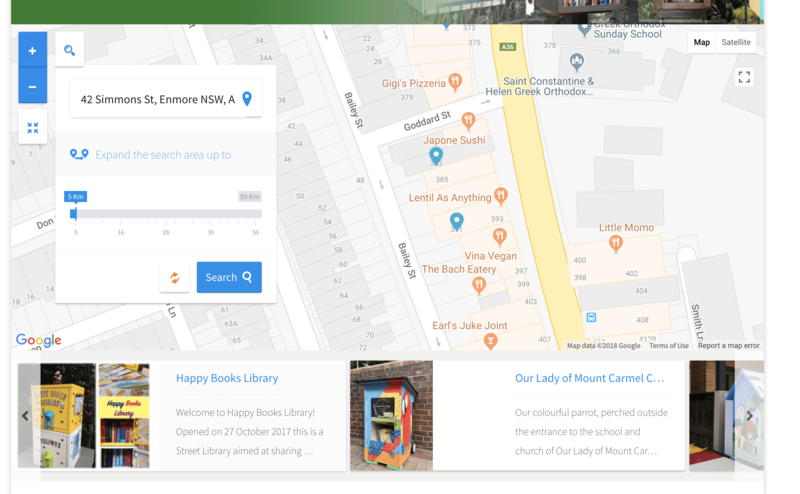 However, some councils do turn a blind eye to great community projects like this, or indeed, have a great set of policies that might encourage Street Libraries. We’ve written a list of the ways council can help here. So, it’s a decision you have to make. But, in the interests of getting things going we’d say – put it on your property. Can anyone give or take books from any Street Library? Do I have to return the exact book I take? Yes, anyone may contribute or take books. The more the merrier! If you take a book (or two) from a Library, you do not need to return that exact book. However, in order to keep the Street Library full of good choices for the whole neighborhood, the next time you swing by the Library bring a few books to share. Street Library book exchanges function on the honor system; everyone contributes to ensure there are always quality books inside. This way, we all win! Street Libraries are, essentially, a box of books, planted in your (or your neighbour’s) front yard. They are accessible from the street, and are essentially an invitation to share the joy of reading. Street Libraries are a window into the mind of the neighbourhood; books come and go; no-one needs to check them in or out. People can simply reach in and take what interests them; when they are done, they can return them to the Street Library network, or pass them on to friends. There’s many ways you can help, read our page on how to help. 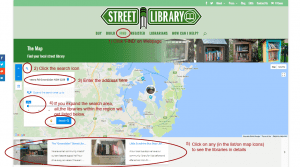 Is Street Library a non-profit organization? We sure are. You can find out more about our organisation on our Contact Us page – reach out to us!. Can I donate to support Street Libraries? If you’re keen to support us, you can sponsor a library, purchase one or donate some in kind materials to us. 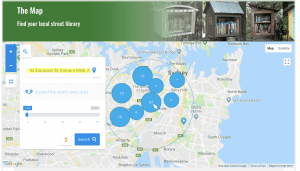 How to find street libraries on the map? Can I pay by bank transfer or cheque for my library? We’ll wait till any payment clears before dispatching your library. I need an invoice for the library I am about to buy!!? Yes – we will provide one by email when you finalise your purchase. Those persnickety folks in the Account Department will be happy, and your library will start winging it’s way towards you. For orders under $1000 that require a Street Library volunteer to fill in “vendor documentation”, we require a $50 documentation fee which will be added to the cost of your order. If you’d like to avoid this fee, you can find all relevant information in our invoice and standard order emails. We apologise for any inconvenience, but 99% of our orders are online, paid for by credit card and do not require documentation of any kind other than what we provide as standard.